The Polmaise Colliery exhibition continues at the Smith. This photograph is from Cowie Colliery, located in Bannockburn. It opened in 1894, ten years earlier than Polmaise, and closed in 1953.The image dates from the 1920s and is of the men who tended the machines which washed the dust from the coal. 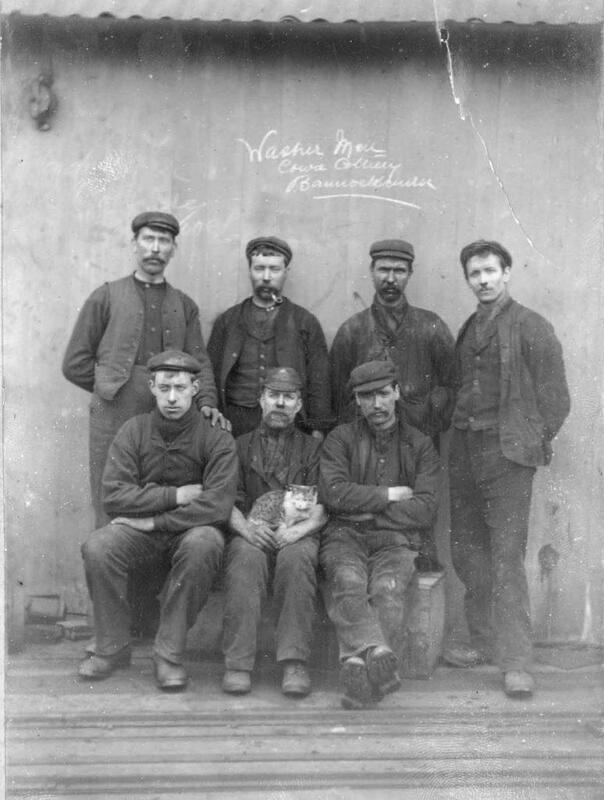 A man in the back row is smoking a clay pipe and the man in front of him has the pit cat on his knee. Many pits were bothered with rats and mice, attracted by the animal feed spilt in the process of feeding the pit ponies, so cats had a part to play in the mining industry. Cowie was a smaller colliery, employing on average 344 men, with 563 at its peak, when it became part of the National Coal Board in 1947. It had baths from 1931 and a canteen. It produced 400 tons of coal a day, averaging 100,000 tons a year. This was mainly coking, house and steam coal of high quality. For generations, Stirling’s economic well- being depended on coal, and in spite of the closure and capping of Polmaise 3 & 4 Colliery in 1987, there are vast reserves of coal still underground.